Health Information Systems – from Present to Future? 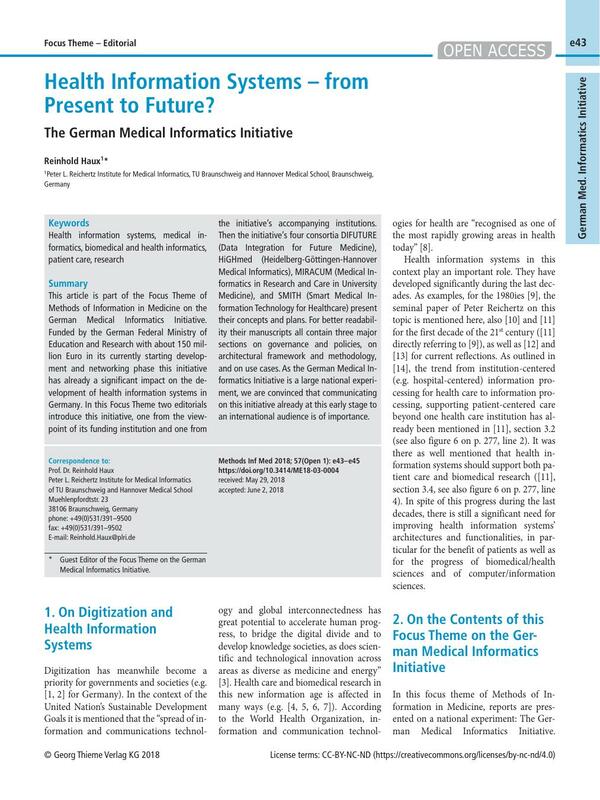 This article is part of the Focus Theme of Methods of Information in Medicine on the German Medical Informatics Initiative. Funded by the German Federal Ministry of Education and Research with about 150 million Euro in its currently starting development and networking phase this initiative has already a significant impact on the development of health information systems in Germany. In this Focus Theme two editorials introduce this initiative, one from the viewpoint of its funding institution and one from the initiative’s accompanying institutions. Then the initiative’s four consortia DIFUTURE (Data Integration for Future Medicine), HiGHmed (Heidelberg-Göttingen-Hannover Medical Informatics), MIRACUM (Medical Informatics in Research and Care in University Medicine), and SMITH (Smart Medical Information Technology for Healthcare) present their concepts and plans. For better readability their manuscripts all contain three major sections on governance and policies, on architectural framework and methodology, and on use cases. As the German Medical Informatics Initiative is a large national experiment, we are convinced that communicating on this initiative already at this early stage to an international audience is of importance. * Guest Editor of the Focus Theme on the German Medical Informatics Initiative. 4 Martin-Sanchez FJ, Lopez-Campos GH. The New Role of Biomedical Informatics in the Age of Digital Medicine. Methods Inf Med 2016; 55: 392-402. 5 Shortliffe EH. Digital Medicine and Biomedical Informatics: What’s in a Name?. Methods Inf Med 2016; 55: 389-391. 6 Al-Shorbaji N, Bellazzi R, Gonzalez FBernaldo de Quiros, Koch S, Kulikowski CA, Lovell NH, Maojo V, Park HA, Sanz F, Sarkar IN, Tanaka H. Discussion of “The New Role of Biomedical Informatics in the Age of Digital Medicine”. Methods Inf Med 2016; 55: 403-421. 7 Knaup P, Ammenwerth E, Dujat C, Grant A, Hasman A, Hein A, Hochlehnert A, Kulikowski C, Mantas J, Maojo V, Marschollek M, Moura L, Plischke M, Röhrig R, Stausberg J, Takabayashi K, Uckert F, Winter A, Wolf KH, Haux R. Assessing the prognoses on Health care in the information society 2013 – thirteen years after. J Med Syst 2014; 38: 73. 9 Reichertz PL. Hospital information systems – past, present, future. Key-note address during ‘Medical Informatics Europe 84’, 5th Congress of the European Federation for Medical Informatics, Brussels, September 10–13, 1984. First published in: Int J Med Inform 2006; 75: 282-299. 10 Kuhn KA, Giuse DA. From hospital information systems to health information systems. Problems, challenges, perspectives. Methods Inf Med 2001; 40: 275-287. 11 Haux R. Health information systems – past, present, future. Int J Med Inform 2006; 75: 268-281. 12 Friedman CP, Rubin JC, Sullivan KJ. Toward an information infrastructure for global health improvement. Yearb Med Inform 2017; 16-17. 13 Gonzalez FBernaldo de Quiros, Dawidowski AR, Figar S. Representation of people’s decisions in health information systems. A complementary approach for understanding health care systems and population health. Methods Inf Med 2017; 56 (Open): e13-e19. 14 Haux R, Ammenwerth E, Koch S, Lehmann CU, Park HA, Saranto K, Wong CP. A Brief Survey on Six Basic and Reduced eHealth Indicators in Seven Countries in 2017. Submitted. 15 Gehring S, Eulenfeld R. German Medical Informatics Initiative: Unlocking data for research and health care. Methods Inf Med 2018; 57 (Open): e46-e49. 16 Semler SC, Wissing F, Heyder R. German Medical Informatics Initiative: A national approach to integrating health data from patient care and medical research. Methods Inf Med 2018; 57 (Open): e50-e56. 17 Prasser F, Kohlbacher O, Mansmann U, Bauer B, Kuhn KA. DIFUTURE Consortium. Data Integration for Future Medicine (DIFUTURE) – an architectural and methodological overview. Methods Inf Med 2018; 57 (Open): e57-e65. 18 Haarbrandt B, Schreiweis B, Rey S, Sax U, Scheithauer S, Rienhoff O, Knaup P, Bavendiek U, Dieterich C, Brors B, Kraus I, Thoms C, Jäger D, Ellenrieder V, Bergh B, Yahyapour R, Eils R. HiGHmed Consortium. HiGHmed M. HiGHmed – an open platform approach to enhance care and research across institutional boundaries. Methods Inf Med 2018; 57 (Open): e66-e81. 19 Prokosch HU, Acker T, Bernarding J, Binder H, Boeker M, Daumke P, Ganslandt T, Hesser J, Höning G, Neumaier M, Marquardt K, Renz H, Rothkötter HJ, Schade-Brittinger C, Schmücker P, Schüttler J, Sedlmayr M, Serve H, Sohrabi K, Storf H. MIRACUM: Medical Informatics in Research and Care in University Medicine. A large data sharing network to enhance translational research and medical care. Methods Inf Med 2018; 57 (Open): e82-e91. 20 Winter A, Stäubert S, Ammon S, Aiche S, Beyan O, Bischoff V, Daumke P, Decker S, Funkat G, Gewehr JE, de Greiff A, Haferkamp S, Hahn U, Henkel A, Kirsten T, Klöss T, Lippert J, Löbe M, Lowitsch V, Maassen O, Maschmann J, Meister S, Mikolajczyk R, Nüchter M, Pletz MW, Rahm E, Riedel M, Saleh K, Schuppert A, Smers S, Stollenwerk A, Uhlig S, Wendt T, Zenker S, Fleig W, Marx G, Scherag A, Löffler M. Smart Medical Information Technology for Healthcare (SMITH) – data Integration based on interoperability standards. Methods Inf Med 2018; 57 (Open): e92-e105. 21 Haux R, Kuballa S, Schulze M, Böhm C, Gefeller O, Haaf J, Henning P, Mielke C, Niggemann F, Schürg A, Bergemann D. Exploring possibilities for transforming established subscription-based scientific journals into open access journals. Present situation, transformation criteria, and exemplary implementation within Trans-O-MIM. Methods Inf Med 2016; 55: 481-487.